Mr. Sudhir Kumar Mishra, Outstanding Scientist & Chief Controller (R&D), DRDO, Ministry of Defence, India who has taken over as CEO & MD of BrahMos Aerospace from 1st August 2014 has a very rich background of interacting with Russia and other countries for International cooperation for around four decades. A Post Graduate in Mechanical Engineering from IIT Madras and Doctorate aspirant from NIT Warangal, India Mr. Mishra has been the Director of Missile Programme and Head Programme office since 2007 in DRDO. He has been closely associated with all missile development related works of DRDO and its cooperation with other partner countries specially Russia. His hand on experience as Programme Manager at DRDL Hyderabad for BrahMos in the initial days of the JV resulted in realisation of flight hardware and other support systems as per schedules. It was his merit performance which resulted in his selection as Technical Advisor at Embassy of India in Russia in 2003. He during his tenure of four years as Technical Advisor (Defence Technologies) in Moscow played a pivotal role in ensuring that the relationship between India and Russia in Defence grew to a new level of partnership. It was his endeavour which resulted in the then Director General & Designer General of NPOM, the Joint Venture partner of DRDO and Share Holder from Russia in BrahMos Aerospace Dr. G. A. Yefremov being awarded the highest Civilian Honour from the Indian Government to any foreigner - The "Padma Bhushan". His interaction with major industries of Russia in particular in Defence Sector has enabled leap frog in technology for many projects under DRDO as well as the three services of the Armed Forces. 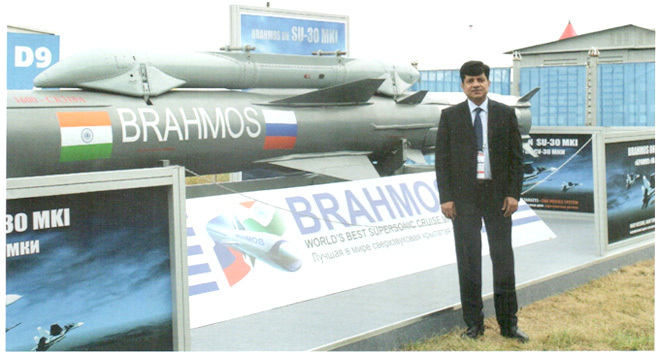 JV BrahMos has benefitted manifolds during his tenure in Russia. The visits of Defence Minister & President of India to NPOM the JV partner were coordinated by him. A high profile Missile Scientist with specialisation in missile project management he has been awarded with numerous awards which includes the DRDO Scientist of the Year Award in 2009 by the then Prime Minister of India. Mr. Mishra is a fellow member of numerous Professional bodies including the Institution of Engineers and the Aeronautical Society of India to name a few. On assuming office as CEO & MD BrahMos Mr. Mishra has set very crisp agenda for the near future which includes several targets. The Indian Prime Minister Narendra Modi had stated that India should now move towards self-reliance in producing military weapons and systems and also look for exporting them to the friendly nations. In these regards, Mr. Mishra said it will be indigenising missile development in India, capacity building for larger production, meeting the production orders ahead of schedule to ensure delivery of missiles on time and ensuring different versions of BRAHMOS missiles to meet the aspirations and requirements of the defence force including Army, Navy and Air Force. Mishra said the Indian contribution has so far been only for the inertial navigation guidance system and fire control system. "We have to focus on indigenously realising the engine and seeker for the BRAHMOS missile," he added. Realisation and start of the flight trial programme of the Air-Launched version by early 2015 for deliveries to the Air Force from 2016. BrahMos Aerospace will begin delivery of the air-launched version of BRAHMOS supersonic cruise missile system to the Indian Air Force (IAF) by 2016, the JV Company's new Chief Sudhir Kumar Mishra has said. He said the air-launched version of the BRAHMOS missile was under progress and the first test-firing is expected to take place by either the end of this year or the beginning of next year. "We have already modified our missile system in terms of its weight and size. The Su-30MKI is undergoing modification so as to carry the strike weapon in its belly in partnership with the HAL," he said. The air version of BRAHMOS will be lighter than its other variants and will weigh 2.5 tonne, though it would be equally potent in firepower and devastating capability as its range and maximum speed of 290-km and 2.8 Mach respectively will remain unchanged. Carrying a warhead of up to 300 kg, the missile would be able to intercept surface targets as low as 10m in altitude. India has placed orders for a total of 272 Su-30MKI fighters with Russia, deliveries of which are expected to be completed by 2018-2019. While Russia has delivered 50 of the fighters, India's Hindustan Aeronautics Limited (HAL) is license-producing the remaining warplanes domestically. Expedite the cooperation on BRAHMOS Mini - between DRDO, NPOM & BrahMos. Supersonic cruise missile manufacturer BrahMos Aerospace has said it is hopeful that a pact to develop a sleeker and faster "Mini" version of the missile will be signed soon. According to Mr. Mishra the mini version of the BRAHMOS missile will have a speed of 3.5 Mach and carry a payload of 300 km up to a range of 290 km. In size, it will be almost half of the present missile, which is around 10 metres long. Mishra said once developed, the missile could be integrated with different platforms including submarines and the Fifth Generation Fighter Aircraft (FGFA) being developed jointly by the two countries. The new BrahMos CEO said he was expecting that the missile would be ready for induction into the services by 2017 and there would be a huge market for the new missile in India, Russia and friendly foreign countries. Parallel R & D efforts to remain a market leader in cruise missile family. In line with Prime Minister Narendra Modi's vision to export defence hardware, supersonic cruise missile manufacturer BrahMos Aerospace has said that South-East Asian and Latin American countries have shown interest in acquiring the 290-km range weapon system and it is possible to export the missile to certain friendly nations. "Several South-East-Asian and Latin American countries want the BRAHMOS, expressed interest in it, particularly for the naval and coastal defence versions. A definite list of such countries already exists. We are progressing with our marketing strategy for exporting BRAHMOS to certain nations, subject to clearance from both Indian and Russian governments," BrahMos Aerospace CEO & MD Sudhir Kumar Mishra said. The inter-governmental agreement between India and Russia for development of BRAHMOS missile also stipulates use of this advanced system to be inducted in the Indian and Russian armed forces as well as export to friendly countries. BrahMos Aerospace officials stress that the current mission of BrahMos is not just further missile technology development but to become a locomotive of high-tech for our both nations for many more ventures. The result of this new mission will be India and Russia leading position in the knowledge world order. A thorough professional and a person full of zeal and enthusiasm Mr. Sudhir Kumar Mishra seems all set to take the role model of cooperation in Defence Field "BrahMos Aerospace" in the near Future to greater heights. A new era is all set to begin in this fruitful partnership.